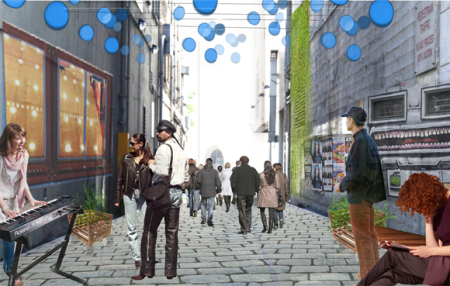 East West Alley Master Plan - Info Sessions.. 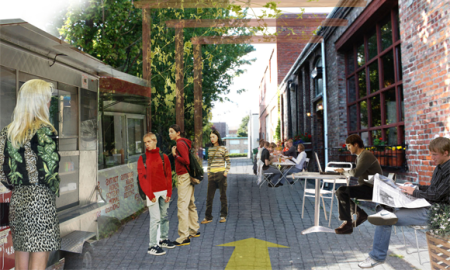 If you are interested in what is going on with the East West Alley Master Plan, there are some meetings coming up later this month and later this summer that you will want to try to attend. The Schedule is posted at the end of this post. The first of the meetings will be next Wednesday at City Hall Room 220 at 5pm. I'm really interested in seeing what concepts will be discussed. Personally, I hope they look at making the alleys intos woonerfs (shared space where pedestrians and bicyclists have priority). Additionally, we should look at paving them in brick from building face to building face. This would add character and further enhance the pedestrian focus. 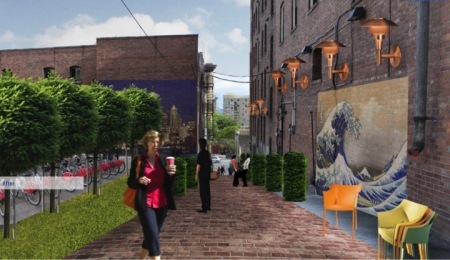 Here are a few imags from Jen Kempson's Integrated Alley Handbook that focuses on converting alleys in Seattle into actual livable places that add value to the city. We could take a page from these concepts.. I took a look at the newest Avalon CGI flyover video that was released last week and couldn't help but think of the Charlie Brown flyover video that I ran across a few months ago. The first represents reality of what can be done when well managed capital comes along and properly (in most cases) engages the community and works with them to provide a product that will work within the context of the city. The second represents a dreamer's vision of a mega project that wasn't well received by the neighboring subdivisions due mostly to the scale of the project. This is an enhanced cross-post from my montly column, Community Design Matters, in The Roswell Current. There may be some editorial differences. First off, to eliminate any confusion you may have, we are the Roswell without the aliens. This Roswell is a beautiful place full of great people and lots of nice neighborhoods. Unfortunately, similar to most US cities, we have a ton of mindless development, run down strip malls and disjointed subdivisions. I’m writing this year to ask for a little help. An Identity - The other Roswell has Aliens.. We need something even cooler. Our neighbor to the north is the Technology City of the South (kinda geeky but it pays well). Our neighbor to the East is the number one suburban city in Georgia (not the identity we really want). Our neighbor to the south is a national model for outsourcing city services (not everyone likes outsourcing). We have the river, lots of cyclists, lots of history, tons of weddings and of course Canton Street. What kind of identity can we create with those ingredients? Appealing Gateways - Santa, do you even know when your sleigh enters Roswell airspace? We don’t have a single gateway in our city that is worthy of being called a gateway. We need beautiful gateways at every major entrance to the city. Especially at Holcomb Bridge/400 and Hwy 9 at the River. A Signature Project - Our neighbors have them so why can’t we? Alpharetta has two, City Center and Avalon. Sandy Springs has their City Center. Could you maybe bring us a boutique hotel at our square? I feel bad for all the wedding guests that come to our downtown and then have to leave to go back to their hotels by the freeway. Remove the Reversible Lanes - Okay Santa, you don’t have to use them but take my word that these things are old and dangerous. The traffic engineer that designed them should definitely be on the naughty list. We need to fix them asap before someone really gets hurt. More Jobs - I don’t know what the unemployment rate is at the North Pole but Roswell currently enjoys one of the lowest unemployment rates in Georgia at 6.5%. Unfortunately, many of those jobs are outside of the city. Our residents commute north to Alpharetta or south to Sandy Springs, Dunwoody, Buckhead and Atlanta. Can you bring some local jobs please? High Quality Apartments - Now you might think this is a bit crazy to ask for but I really want to see some high quality apartments, especially in our most walkable areas. The kids these days just don’t want to buy homes and the apartments in our city aren’t the kind they want. If we are going to diversify and attract the next generation of talent to Roswell, we need some new apartments. I Almost Forgot... Can you bring us an outdoor recreation complex that would have a Major League Soccer stadium, a whitewater rafting center (like the one in Charlotte), an aquatic center and a velodrome all with a hotel and some retail? You could even package them all together in one location and brand it as the Outdoor Recreation capital of the south (take that Alpharetta geeks!). What’s that Santa? I’m crazy, you say all that can’t fit anywhere in Roswell? Not so fast Santa.. you could plop it down perfectly on the southeastern quadrant of the Holcomb Bridge/400 intersection... and you could even fit a MARTA stop there but the people on the naughty list don’t like trains (even at Christmas) :) Here's a quick sketch if you need help imagining it. Now, let’s get those elves to work! p.s. This post has a different title than the column in The Current. The title of the column was not written by me and I do feel that Roswell is very unique... actually moreso than our neighbors Alpharetta, Marietta and Sandy Springs which is why I love living here. I apologize if the title offended any of my readers. Despite urbanization, the old suburbia will endure. Duany estimates that at least 40% of homebuyers will favor big houses on big lots with a few cars. "I had someone ask me, 'Why would I want to know my neighbor?'" Duany marvels. "Someone else said, 'No drive-thrus? Have you ever unstrapped a kid out of a car seat?'" But as much they might like conventional suburbia, many people will not be able to afford it. So they'll try New Urbanism, Duany says, and they'll like it -- shorter commutes, more vital street life, less money wasted on gas and home heating and cooling. "You have to work hard to support a conventional suburban lifestyle," he says. "People will be pleased by how much they'll be able to ease off." They also asked him for insight on the five trends he sees in the next 30 years. Here's what we can look forward to accroding to Duany. Check out the article if those predictions intrigue you. This eveining at City Hall, Roswell City Council and the public had the chance to see an evolutionary proposal for what the heart of our city could be. City staff and the Downtown Development Agency presented and opined (in that order) on a transportation and economic development (in that order) project that will impact the heart of our city. There were about 30 citizens and stakeholders present to see the concepts that were sparked from (but wildly different than) the DPZ master plan concept. The configurations that were presented (all slight variations from the image above) are significantly different from a traffic flow standpoint than what Andres Duany and DPZ proposed for the area but DOT couldn't make the DPZ proposal work with traffic models. The good thing is that DOT has a CNU accredited staffer in Clyde Stricklin who worked on the post-street design configuration. It heps to have someone who at least speaks the language of urbanism to refine design around big roads. Pretty much everyone in the room was in favor of moving forward, albeit cautiously, with planning this project. The mayor requested that staff and the DDA work together to try and refine the design details and potential economic impact before going external to hire a town planner. I agree with the approach but feel this is a very delicate project. If it is done incorrectly, it could be disasterous for the heart of Roswell. If it is done correctly it could be huge. The estimated costs are $8-$11M for the roadway and park features. Buildings, etc. would be a separate tab with a mixture of public and private uses. This is a cross-post from my montly column, Community Design Matters, in The Roswell Current. If you haven’t noticed, something’s afoot in Roswell. Specifically, in Historic Roswell. It started over a dozen years ago when the city and gritty business owners started nudging Canton Street toward greatness. Now anchored by regionally recognized restaurants and retail, it is known as one of the great places in Atlanta. The next big step was the 4-year community project that ultimately resulted in the approval of the Groveway Hybrid Form-Based Code in April. Let’s not forget the Atlanta Street Livable Centers Initiative completed in 2008 that served as the backbone for later plans. Another critical step was the Midtown Streetscape project and the Roswell 2030 plan that was adopted earlier this year. On top of all this, we recently created a downtown development authority and the Roswell Business Alliance. The city’s first Strategic Economic Development plan was just finished and presented to the public this summer. We are kicking off a citywide visioning process as well as completely overhauling our zoning codes. We are down to two final alternatives for the Historic Gateway transportation project that will finally eliminate the dangerous reversible lanes. Last but not least, Duany Plater-Zyberk (DPZ) just presented their Master Plan for the Historic District last month. It is simply amazing what has been completed and/or initiated in just the past few years. However, much of this is merely planning and strategy. City Hall has more plans than it knows what to do with. Now, it’s time to act. The first step is to define the heart and soul of our city. The DPZ Master Plan does just that. It outlines three unique villages from the Chattahoochee to City Hall that build off the amazing diversity of landscape, topography, history and culture that already exist along the Atlanta Street corridor. Those three villages would create walkable destinations that are inherently Roswell, while catering to the people who live here more so than the cars that drive through. They will complement the renovation of Atlanta Street. Residents overwhelmingly want this to happen. The primary landowners are dying for a reason to develop this area. All the city needs to do is provide direction. Our elected officials have accepted this vision, and are working to give the city the unified vision it needs to achieve greatness. I for one am tired of being a Sandy Springs/Alpharetta sandwich with a side of East Cobb. Roswell is a great city, but it’s great for mainly one thing, housing. Our future lies in communities where people live, work and play, not where they sleep, drive and watch TV. Showing this commitment to walkable, mixed-use, fun neighborhoods in the heart of our city will not only strengthen our conviction to build an incredible place, but it also announces to businesses and neighbors that Roswell is committed to becoming the best city in the region in which to Live, Work and Play. Each week, New Urban Roswell brings you our Top 5 most interesting and thought provoking articles about urbanism and neighborhoods. We sifted through about 100 articles this week to find the top 5. We hope you enjoy. Embedded in this article is a very interesting statistic that goes beyond the headline. That statistic is that the average annual cost for owning a mid-size car in the US is $9,519 when you factor in all pertinent costs and assume annual mileage of 15,000. That’s almost 65 cents a mile! It’s a statistic that’s just crying out for some common sense. Much of the current debate in Atlanta is about the Transportation Investment Act and the fact that 48% of the money is allocated to roads... this statistic tells me that we might want to consider lowering that. Assuming that you have a 10 mile commute, your round trip is costing you about $13!!! WOW! Bet you didn’t think about that. We need to start building walkable places where people aren’t forced to use their car and can even consider reducing their car ownership. The automobile is a drag on our national wealth. The logical, if somewhat extreme, outcome of the conservative dismissal of Smart Growth is the anti-Agenda 21 movement, which connects non-existing dots between the United Nation’s Agenda 21 sustainability agenda, President Obama’s green policies and efforts in Virginia’s cities and counties to implement Smart Growth. Thus, in this conspiratorial mindset, anything resembling Smart Growth is seen as part of a larger movement to undermine American freedoms and liberties. Frighteningly, this movement has gained momentum in a number of Virginia counties and created a distraction from the real issues. If you really have some time and are interested, you can listen to a panel that Mr. Bacon was on at CNU 20 here. This is a great posts that throws some ideas and thoughts out on how some small, experimental ideas could improve the overall development picture of towns and cities. The three ideas that are thrown out for consideration are building a local building bank, moving to land value taxation rather than building value taxation and encouraging/allowing code free zones where a city can experiment with what an area with no zoning would develop like. I feel that experimentation of this nature is not only a good idea but necessary to move into the next generation of development in this country. The systems we have now are dysfunctional at best and toxic at worst. All I can really say on the newly revised plans for Alpharetta’s city center are WOW! The plan as it is would create an incredible mixed-use destination that is quaint, people focused and inherently local. This plan is about a mile away from Avalon but it is extremely different in the way it will interact with people. I think once both are done, there will be no question that this project will win the ‘lovability’ contest. Great work Alpharetta! I’m more than a little bit jealous that Roswell’s neighbor city seems to be a step ahead of us in redeveloping it’s urban core. How could being stuck in traffic lead people to be more productive? The relationship is almost certainly not causal. Instead, regional GDP and traffic congestion are tied to a common moderating variable - the presence of a vibrant, economically-productive city. And as city economies grow, so too does the demand for travel. People travel for work and meetings, for shopping and recreation. They produce and demand goods and services, which further increases travel demand. And when the streets become congested and driving inconvenient, people move to more accessible areas, rebuild at higher densities, travel shorter distances, and shift travel modes. If you read this blog, you probably know that I'm a fan of DPZ's work and have posted before (here & here) about our need to have this firm in particular work on a master plan for our city. Well, I got my wish (partially) and I'm not disappointed by what they have delivered in the early stages. I had originally planned to tweet these while I was participating in some of the workshops but I quickly realized that I would spend more time tweeting than paying attention and participating. There were a lot of interesting ideas and discussions that occurred and I'm not pretending to have captured most of them. I'll start off with the big ideas that I was able to capture and move into some other ideas, observations and discussion points. Square at City Hall and Canton Street - Create a large square on the backside of City Hall that would create the possibility of three additional civic building sites that would surround the central square. The road would be one way all the way around the square. To give you an idea.. if you were coming north on nine.. you would make a right on Hill Street and then a left on a new street that would take you north and reconnect with the existing Hwy 9 alignment just north of City Hall.. the very rough diagram below will give you an idea (this is VERY rough and only intended to illustrate the concept). Duany compared our current municipal complex to a bunch of stray cats. This design would definitely solve the stray cat problem and it would create an unforgettable statement of "This is Roswell" for anyone driving through town. Canton Street South... - Create a narrow walkable street from Oxbo south to Mill St that would give a Canton St feel. This one was incredible and I don't think many people have thought of this until now. The feel that could be created would be second to none in Atlanta. New but strikingly unique and well proportioned for a small historic town center. Shops on Park Square - Eliminate the street between the shops just north of Park Square and connect those shops to the square which would enable cafe style dining that would activate the square much more than it is now. Historic Gateway One-Way Pair - Duany wasn't a huge fan of the one-way pair. He kept pondering how this idea made it through the selection process. He understood that the residents in that area want a more walkable neighborhood center and promised that he would propose a solution that would work with the proposal. There was some opposition at the presentation from some of the residents of the Creek View condominiums. This was the first strong opposition that Duany said he had heard to the concept but it was predictable. He told them that the only reason they should accept the loss of privacy is if they in turn have some great urbanism created in the area. I may post more on this at a later date as it is definitely interesting and will come up again. Boutique Hotel - They definitely didn't feel that the Boutique Hotel Concept was dead. They felt that if the Oxbo to Mill St connection were built that the hotel could serve as a wonderful anchor to the end of that street. Views of Barrington - The view of Barrington coming down Mimosa is easily correctable with some slight landscaping adjustments. They weren't pro or against removal of the wall at this time but they definitely felt that the view of Barrington needed to be improved when viewed from Mimosa. Adopt the ITE Context Sensitive Solutions Guidebook - Duany strongly recommended to the DOT personnel in the room that they adopt the 'Institute of Transportation Engineers - Context Sensitive Solutions in Designing Major Urban Thoroughfares for Walkable Communities' as the official road design guidelines for Roswell. I know DOT was taking notes and hopefully this will appear on the agenda soon for the council. Extend Oxbo Trail to the Cemetery - I thought this was an incredible idea that just hasn't been considered. An extension of Oxbo Trail up to the old Presbyterian cemetery. This would really complete the trail and give an alternative walking path for residents of Mill Village to get up to Groveway. I see this one happening relatively quickly. Activating the Square - There isn't much you can do with the Park Square to make it a more lively spot. A true square needs to be surrounded by buildings on all side that can participate and overflow into the square. The separation by high volume roads poses an insurmountable challenge. It should remain a sense of pride for the area and serve as the location for most festivals but intervention most likely won't work. Slight Curve of 9 at the Square - This was actually a fantastic idea and is a quick solution to a large problem. Duany proposed a slight bow or arc in the road in front of the buildings facing the square in order to give them more sidewalk space. This arc would eat into the square slightly but create a beautiful arcing motion in the fence along the square and additionally slow down the traffic in that spot slightly. Alter the Pavement in Important Places - He was specifically speaking of Hwy 9 from Mill St to Sloan St in the same area as the curve mentioned above. Essentially, you would put brick pavers down and alter the texture of the road to remind drivers that they are in an important space. This texture combined with the arc would really create a nice space without significantly altering anything. Riverside|Azalea|Hwy9 Intersection - Leave the intersection at Riverside|Azalea|Hwy 9 as is. Any improvements will not realize the intended traffic flow improvements and won't be worth the investment. Duany was specifically opposed to the roundabout/underpass option that is the city's preferred option. I actually disagree with him on this one. Gateway at the River - Do we really need a gateway? This is what Duany was asking. The bridge itself is great and the river is a de facto gateway. Additionally, the drive downhill from Sandy Springs and then up from the river once you are in Roswell is a powerful statement that you are entering a different place. Whatever we do, we shouldn't let a new bridge get built with higher rails that will impede the beautiful views. I didn't hear of any mention of the planned pedestrian bridge in any of the workshops I attended. Apartments at the River - These apartments will be gone in 10-20 years. The city needs to figure out what they want that land to be. There was a quick draft of a building that looked nice that was presented at the presentation. I'd love to see something like what they drew up. Pedestrian Tunnel Under 9 to Connect Canton to City Hall - Duany was definitely not a fan of the current idea to tunnel under 9 to enable people to park easier at City Hall. He says people just inherently don't like tunnels or overpasses and ineveitably people will cross at street level. Other considerations were the ADA requirements for a tunnel or overpass. He definitely ruffled some feathers on this one. I feel that a crossing at street grade is more preferable. There were a lot of the large real estate holders in attendance at the workshops. They all seemed optimistic to the ideas that were being proposed and much of the land that was pointed to for redevelopment is in the hands of only a few major owners which increases the probability of something happening. Planning is sequential in nature. You plan for what you want the area to be like in 25 years but you need to allow it to grow. You don't plan for 4 story mixed-use and force that to be the only allowable condition. One story gradually moves to 2-4 stories. You have to allow that flexibility and the ability to change over tme. Style should steer clear of the classical stuff like our historic homes and instead work to emulate the Mill Style and Factory Building feel in most cases. The highest vehicular throughput for a road is at 27-29 MPH according to the ITE. Thus, in order to accommodate the most traffic volume, Hwy 9 should be designed to have as little stop-go as possible while maintaining a speed around 30 mph. It used to be that cars traveling through towns were under the rules of that town. We need to take back our space and ensure that cars coming through Roswell know that they are in someone else's town and that they need to behave accordingly. This road should deliver a message that this is primarily for Roswell, that guests are welcome, but they are here on Roswell's terms. Retailers will go in and out of business without "our help" was one of Duany's points when discussing what a one-way pair would do to business along 9. He poined out that most of the business that is currently there is undesirable (unless you are the business owner). The one-way pair can work if done properly and not negatively impact desirable businesses. Duany observed that the design system in Roswell is fragmented and there doesn't seem to be a high degree of intradepartmental coordination. DOT isn't talking to Parks who isn't talking to Community Development, etc. He was especially critical of the design of some park areas which offended a few people in the room. He then tried to make the point by saying that everything he designs is given to someone else to improve on and that there is nothing wrong with that. He implied that criticism and collaboration create better places. No too many city council members were in the workshops but it seemed like half of them were at the presentation. I could be wrong on that as I did not attend all workshops. DPZ is attempting to do something that has never been done before with the hwy 9 plan. The linear coding sheet (comparison to a musical score) that they are putting together for the entire length of the street is something that Duany came up with about 15 years ago but he has never used it. He says he has never come across a street with as much complexity as this stretch of road and felt this was the perfect opportunity to work on something revolutionary. It truly is unorthodox but if it works, it will be amazing. We shouldn't have any reason to believe based on track record that it won't work. From what I can tell, there might be a little animosity between the city and the planning staff. The selection of DPZ was a close vote, with the mayor being the deciding vote. This is a shame because regardless of who is doing the work, the city should recognize that this is a transformational opportunity that doesn't come along frequently. We need both of these groups to work in concert for this to be the best possible outcome. The first few days of actual interaction with DPZ and the city have gone very well. Ideas were generated, issues were clarified and significant progress on the plan has been made. Duany is very interested in Roswell and had great things to say about the historic district in public and in private. This should be the beginning of something great for our city. We are looking forward to the next round. Stay tuned.. I will update you as soon as I know more about when additional workshops and potential talks are scheduled. 2011 Recap - Keep up the Good Work Roswell! Midtown Streetscape - Initial work has been completed and is a great improvement. Norcross|Grimes|Warsaw Roundabout - This has been a huge hit. Oak Street Streetscape Improvements - This came together nicely. The street no longer looks like an industrial dump. Wayfinding and Road Signs - These have added even more character to the HD. Info Kiosks - Well done, they still need to get the info on them but the kiosks and the maps look great. Improved Bus Stops - These are a great improvement for the neighborhood. Table & Main - A great addition to the Roswell Restaurant Scene. Roswell Provisions - How can you not love this place? Nice addition to Canton St.
Roswell Tap - This was a good addition along hwy 9. We miss suburbanite pizza but we'll take the tap. Roswell Restaurant Week - The 1st annual event was a hit. Renew Social Ventures - The rehab of their building has been well done and we appreciate what the organization is doing. Food Access - One of the biggest obstacles to making the Historic District a vibrant living spot is the lack of a walkable or bikable grocery store. We think there may be an announcement sometime in 2012 about a small(er) grocery store going in somewhere near the HD. Unfortunately, it won’t be a Trader Joe’s or a locally owned market. A Fresh Market would be good or even a Publix GreenWise Market. However, it will most likely be a Walmart Neighborhood Market. So, our HD might just be graced with the beautiful tan and green color scheme that WMNM's are trying to force feed their new suitors. I'll stop griping now and dream about riding my bike to the grocery store. Locally Grown Food - A community garden will open in the Historic District... maybe at Barrington Hall? Farmer’s Market - The saturday farmer’s market at city hall formerly known as the Riverside Farmer’s Market will stay put even though we think it would be a bigger draw if it moved to either the Canton Street Antique Market parking lot or to the square. The city’s allowance of additional markets (i.e. Sweet Apple Village) will cannibalize business and potentially end the one at city hall. Historic Square Sidewalks - We will finally have completed sidewalks along the square and around Barrington Hall. Or at least mostly completed sidewalks. Construction is slated to start sometime this month. Oh yeah.. we’ll get some nice new traffic light poles as well which will take some of the unsightly wires out of the air. Building a Network - Work will continue on the plans for the Oxbo Rd realignment and Elm Street Connection to Oxbo. However, no actual work will start for another couple of years. We are very excited about this initiative. Historic Gateway Master Plan - DPZ, the world renowned team that designed Seaside, will completely rock the master plan for the historic district laying the groundwork for Roswell to become the best place to live in the northern burbs as well as a regional destination. Some might say we are now but we don't have a grocery store and if we are to be a destination and at a minium we need a hotel to be a destination. To get this all started, we just need to find the private investment. Hmm.. Maybe the DDA can work on that. Form-Based Code - Roswell’s first form-based code will officially be approved for the Groveway Community. This will be another huge event in ushering in a new age for Historic Roswell and it will hopefully become a trend in the Atlanta area. Downtown Development Authority - Our prediction is that the DDA will focus too much on large empty shopping centers along Holcomb Bridge and the HD will be a smaller part of what the initial design for the DDA was before the opportunity zone was expanded. Tax Increment Financing - The newly formed DDA will start to talk about implementing TIF in the revitalization area but nothing official will happen. We need to be very careful with this tool. Alive After 5 - Our premiere event will continue to thrive and there will be a strong push to close down Canton Street during the event. We think it should be closed from Norcross St to the Hwy 9 intersection from 5-8pm. There has been a push for this recently after a teen was hit by a car last year. Riverside Park Area - Plans will be finalized for two projects.. the extension of the riverside trail will be approved despite NIMBY and Environmental Concerns. The design plans for the bike/pedestrian bridge over the Chattahoochee River will be finalized and approved. Some think this is a waste of money and there will probably be a little bit of a fight. We love the idea but think the bridge design will be a disappointment to some. Large Employer Void - We don’t expect any major announcements here but we do expect the city to court a large employer to move operations to the historic district in conjunction with the Groveway neighborhood revitalization plan. The mayor's recent annual state of the city speech to the Roswell Kiwanis was an indicator that the city is going to push economic development in 2012. Additionally the formation of the Roswell Business Alliance last year and DDA will help but we won't see much movement this year. Development Revitalization - Several developments will get new life. We are guessing that there may be some action on foreclosed Vickery Falls development just south of Chaplain's on South Atlanta Street due to the prime location and the added focus on cleaning up the area around the square. This could push out into 2013. Goulding Estate for Sale - The $8.75M, 16 acre Goulding Estate will not move this year. However, when it does in 2013, the land will be subdivided into ridiculously expensive smaller lots. We think the the original building will remain intact and potentially become another event facility (we don't need more though). Charlie Brown Part Deux or Trois?- Someone will make a pitch for the old Charlie Brown parcel on the southeast corner of 400 and HBR. Citizens on the east side of town will say it will ruin their lives by increasing congestion and bringing crime to Roswell in the form of nefarious transit riders. Transit Bill - TSPLOST will pass (barely) and Cobb county will still have no idea how to get its collective act together. Ponce City Market - Work will begin on Ponce City Market late in the year. This will be a huge step in the continued revitalization of the Old 4th Ward. Avalon (formerly known as Prospect Park) Alpharetta - The development that I like to call The Avenue Avalon will gain approval from the Alpharetta council with two dissenting votes even though the development would further tilt Alpharetta's target ratio of apartments in the city above the 85/15 ratio that is approved in the city's comp plan. Stay tuned for the March 26 Alpharetta City Council meeting. North American Properties will begin work later in the year. The Beltline - The trail portion of the Beltline that connects Piedmont Park to the New 4th Ward Park will open up and will become an instant hit amongst locals and non-locals. We will see a more formal timeline of transit implementation after the Transit Bill is passed this summer. The Atlanta Streetcar - Love it or Hate it, construction will start this year! Boondoggle Field at Art Blank Stadium - This true taxpayer ‘boondoggle’ will continue to be pushed even though no NFL stadium has EVER created a net positive economic impact. Paying half a billion for something that will be used ~10x/year just isn’t a wise decision. The Multi-Modal Passenger Terminal (aka The Gulch) - We will see the initial vision of this project toward the end of the year. Long range economic impact estimates were already released and the number look very positive. Well, that's it! If you made it this far, you're a true NUR fan. Thanks and have a great (rest of) 2012!